Surgery to fuse thoracic and lumbar spine. 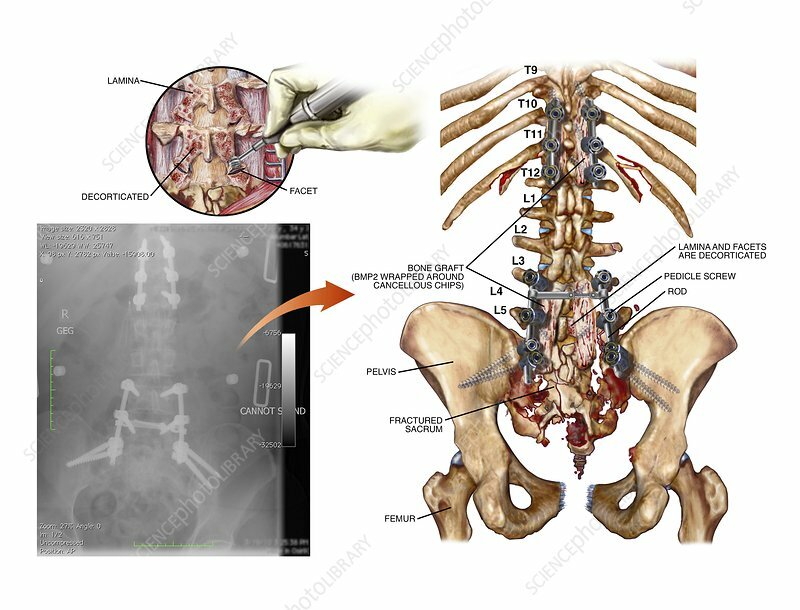 Labelled artwork and corresponding X-ray showing the results of surgery carried out to fuse part of the thoracic and lumbar spines to protect nerves at risk from spinal degeneration. At upper left, a bur is used by a surgeon to decorticate the lamina and facets of the vertebrae. At lower left is the post-operative X-ray. At right is a posterior view of the pelvis and spine, showing pedicle screws, rods and bone grafts used on both sides of the spine to reinforce and hold it together. This surgery has been done due to a fractured sacrum, typically caused by a heavy impact to the groin and the lower spine.